UPNG Second Vice Chancellor’s Lecture of 2017 (from left to right) Lady Winifred Kamit, Founding Chairperson Coalition for Change, Ms Evan Biesco, case manager with Femili PNG, Ms Rosie Batty, Australian of the Year 2015 and Ms Monica Toiseneglia, HR Manager Steamships Transport. The Papua New Guinea – Australia Partnership continues its focus on improving gender equality and ending family sexual violence in the country. A recent visit by anti-violence campaigner and 2015 Australian of the year, Rosie Batty, was an opportunity to showcase some of the achievements of the partnership. In the law and justice sector, Australia in partnership with the Family and Sexual Violence Action Committee (FSVAC) is working to improve coordination and quality of services provided to survivors of violence. Australian High Commission Minister Counsellor, Rod Hilton said a recent workshop brought together provincial police, state lawyers and other stakeholders, to identify challenges and opportunities to improve services such as legal aid, medical attention and psychosocial services for survivors of violence. “An effective response to ending family and sexual violence is about better access to justice, improved support services and ultimately, prevention,” Mr Hilton said. Secretary for the Department of Justice and Attorney General and Chair of the National FSVAC, Dr Lawrence Kalinoe, described the workshop as an investment that would make a real impact on the lives of people. 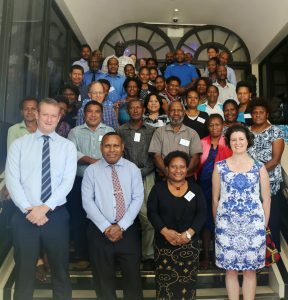 Australian High Commission Minister Counsellor Rod Hilton (Front left), Department of Justice and Attorney General Secretary and Chair of the National FSVAC Dr Lawrence Kalinoe and participants of the referral pathways workshop. “We have to make sure that whatever is written in the law actually gets translated into physical, tangible systems on the ground, and that they function properly,” Dr Kalinoe said. Ms Batty who was the guest speaker at the workshop, commended participants for their passion and commitment to bringing about change. Ms Batty also participated in the University of Papua New Guinea Vice-Chancellor’s Lecture supported through the Pacific Leadership and Governance Precinct. Ms Batty said family violence needed to be part of the conversations at schools, in the workplace and at homes all over the world. 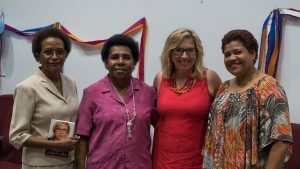 Ms Batty was in the country as part of her tour in support of Femili PNG, a local family and sexual violence case management centre based in Lae. The Papua New Guinea – Australia Partnership works across a number of sectors including education, health, law and justice gender and sport.